The 1988 Suzuki Cavalcade LX for sale in is a RARE Suzuki Cavalcade LX, PRODUCTION YEAR 1988 that is painted MAROON AND RED with ONLY 57,000 miles on it.. The motorcycle has a DIGITAL GEAR INDICATOR and a COMPUTER ICON that informs the rider if the battery is bad, if there is a light out and makes him aware of other mechanical problems. like this motorcycle with its STOCK 112 HORSEPOWER engine and is WATER COOLED, SHAFT DRIVE, with an ELECtRONIC CRUISE CONTROL, AUTO LEVELING SYSTEM, AUTO VOLUME CONTROL, DASH VENTS FOR COOLING and BUILT IN HEATERS FOR WINTER RIDING. It has an AIR BLADDER IN the REAR SEAT AND TWO IN BACK REST that are ADJUSTABLE TO KEEP your PASSENGERs HAPPY. The Suzuki Cavalcade LX for sale ALSO HAS THREE WAY ADJUSTABLE FLOOR BOARDS FOR PASSENGERs, BATTERY, CLUTCH ,AND SLAVE CYLINDER and HEAVY DUTY BARNETT CLUTCH SPRINGS. It HAS AIR WINGS FOR COOLING OR WARMER RIDING. It HAS NEW RUNNING LIGHTS AND CUP HOLDER to hold YOUR COFFEE OR COLD beverages. Motorcycle's TIRE was RECENTLY REPLACED and I also REPLACED STEREO and HAD ALL 16 NEW SWITCHES INSTALLED FOR FLAWLESS FUNCTION ON YOUR CROSS COUNTRY TRIPS OR LOCAL RUNS. The 1988 Suzuki Cavalcade LX for Sale gets an impressive 38-42 MILES PER GALLON of fuel and RUNS LIKE NEW. You can easily PULL a LARGE HILL IN fifth GEAR with LOTS OF TORQUE so there is no real NEED TO shift the gears down. The 1988 Suzuki Cavalcade LX for Sale is a lOT OF motorcycle FOR very LITTLE MONEY! RIDE from ANY WHERE or interested buyers can FLY IN and I'LL PICK YOU UP AT THE AIRPORT as it's ONLY 13 MILES FROM where the motorcycle is located and you can RIDE it HOME. 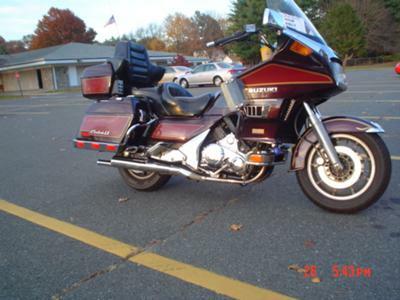 Or if you are in Connecticut or Massachusetts within a 50 mile range I'LL DELIVER your motorcycle FREE of charge AT FULL PRICE. Just sent me a MESSAGE if with your contact information using the space below provided by GoGoCycles Used Motorcycles for Sale and I will get back with you as soon as possible. THIS CAVALCADE HAS BEEN SOLD! The motorcycle NEEDS NOTHING and is READY TO ride. I just spent $2800 ON UPDATING the bike and I was previously asking $4500 but I have REDUCED the price in hopes of making a fast SALE.